114 • FOODSERVICE EQUIPMENT & SUPPLIES • SEPTEMBER 2017 chain profile drawers), and for making soups and stocks during prep time. Next follows an eight-burner range, also used for soups and stocks, sushi rice, as well as for hot pots and various sauteed dishes. Below the range sits a conventional oven that culinary staff use to bake items like sweet potatoes and an occasional fish dish. 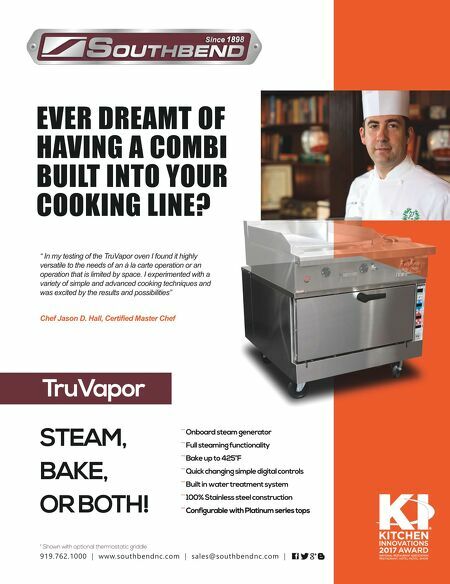 Roka Akor uses a combi oven, the final piece on the line, for baking desserts and steaming items. While the hot line sits along the back wall, kitchen staff can turn around 180 degrees (facing customers) to find the plating and garnishing stations. While most operations use basic refrigerated tables with cold wells for this task, Roka Akor has solid marble worktops with no wells. As with the sushi station, undercounter drawers hold the garnishes to maintain their freshness. The marble worktops, meanwhile, look better than stainless steel and are easier to clean, an important feature for a display kitchen, Bian says. "Cleaning is the first priority," Bian says. "We literally spend a whole week training people how to clean their sec- tion during their work, before their work, after work. It's all about procedures." The hot area flows directly into the third kitchen section, the dessert kitchen, which sits at the corner of the "L." This station features two countertop mixers (one large, one small), a freezer and an ice cream machine. Following the dessert station is the robata grill on which staff cook steak and seafood dishes. This custom-made unit has three sections, each with three levels, allowing chefs to adjust cooking temperature by moving items up or down a level. Roka Akor's robata uses charcoal and wood for fuel, creating a dramatic cooking display with flame and hot coals. A small amount of wood is held underneath the island coun- tertop where the robata sits, with a larger supply stored in the back of the house. Worktops with under- counter refrigerators, which hold seafood, steaks and garnishes, surround the island. With such an impressive front-of the-house display, Roka Akor has minimal equipment in the back of the house. The pri- mary station consists of a sink and work surface for prepping fresh fish. This station also has a "super refrigerator" that reaches -90 degrees in order to freeze fish used in sushi, as required by health regulations. Beyond that, most of the prep work occurs up front in the production kitchen. Morning prep starts at roughly 8 a.m. with a dozen kitchen staff. The restaurant closes after lunch, giving team members the chance to prepare for the dinner shift. 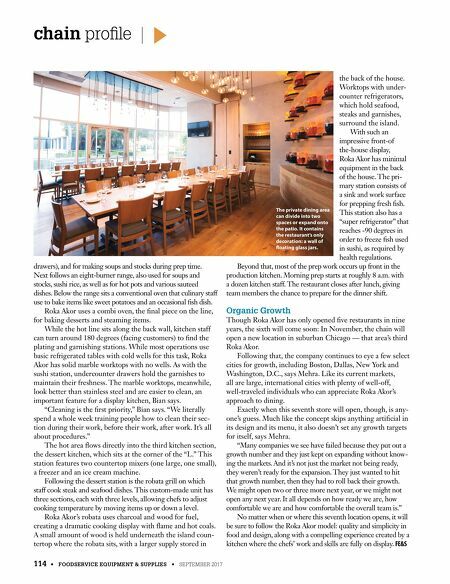 Organic Growth Though Roka Akor has only opened five restaurants in nine years, the sixth will come soon: In November, the chain will open a new location in suburban Chicago — that area's third Roka Akor. Following that, the company continues to eye a few select cities for growth, including Boston, Dallas, New York and Washington, D.C., says Mehra. Like its current markets, all are large, international cities with plenty of well-off, well-traveled individuals who can appreciate Roka Akor's approach to dining. Exactly when this seventh store will open, though, is any- one's guess. Much like the concept skips anything artificial in its design and its menu, it also doesn't set any growth targets for itself, says Mehra. "Many companies we see have failed because they put out a growth number and they just kept on expanding without know- ing the markets. And it's not just the market not being ready, they weren't ready for the expansion. They just wanted to hit that growth number, then they had to roll back their growth. We might open two or three more next year, or we might not open any next year. It all depends on how ready we are, how comfortable we are and how comfortable the overall team is." No matter when or where this seventh location opens, it will be sure to follow the Roka Akor model: quality and simplicity in food and design, along with a compelling experience created by a kitchen where the chefs' work and skills are fully on display. FE&S The private dining area can divide into two spaces or expand onto the patio. It contains the restaurant's only decoration: a wall of floating glass jars.